The monitor continuously measures the temperature of selected areas such as the engine and generator compartments in motorhomes. The temperature of the selected compartment is displayed on the monitor. The temperature display can be switched between the engine and generator compartments. If an alarm level is exceeded, the display automatically switches to the affected compartment and an alarm is announced by both an LED light and an audio alarm. The monitor incorporates several fail-safe features and the display assures the owner that the unit is functioning and ready to notify the owner of a problem. It has two levels of alarms for each compartment. The first level is an advisory alarm that the owner sets, based on historical temperatures of that compartment. 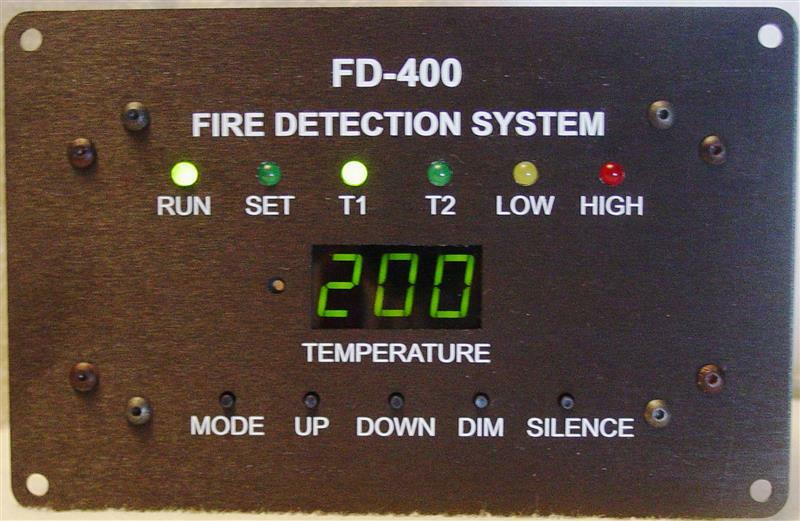 The second (or “high”) alarm level is set to a fixed temperature that indicates a very high probability of a fire. If a high-level alarm is triggered, a dry-contact relay is activated. This relay can be used to activate a fire suppression system. It can also trigger secondary functions. The monitor is enclosed in an anodized aluminum enclosure which is designed to be flush mounted in the dash area, but it can also be easily mounted in other locations using an optional bracket. The faceplate is 7.0 by 4.5 inches.